Last week while I was doing my early Wednesday morning walk through the famed Santa Monica Farmers Market, I spotted something new for sale. On several vendors’ tables, there were mounds of large, verdant green, puffy, yet crooked beans. 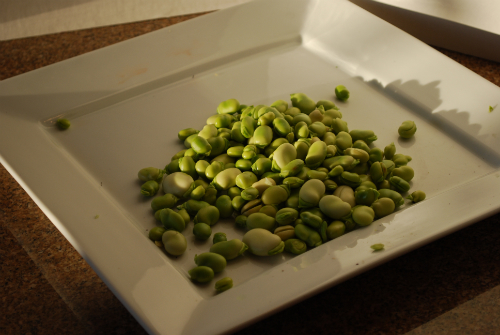 In a word fresh fava beans had arrived for early spring. I have a memory in my head of a prized dish called Ava Frescas, but what it was exactly I don’t recall. Incidentally, the name of this dish is a good example of the Ladino (Judeo Spanish) language in action. I believe that ava frescas is Spanish and anjinara is Turkish for artichoke. I phoned my cousin Louise Chiprut Berman up in Seattle and she remembers it was the whole fresh pods or the shelled beans cooked ‘con tomat’ style, which means simmered with tomato sauce and fried onions. My sister Carole remembers a dish of cut up whole pods, when they were very fresh, layered on the bottom of the pot, with the beans on top. I asked my mother but unfortunately, she said you just cook them, which I assume means you stew them with some fried onions to start and then finish braising in a little water and lemon juice. It is sad to watch the vibrant woman who is my mother starting to forget things. She will enjoy her 92nd birthday this summer. I wanted something more, so I started looking at cook books. 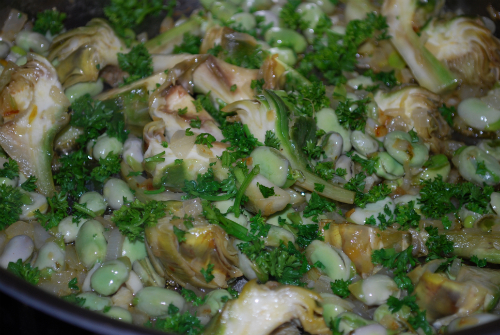 I found several recipes including one by Gil Marks, a prolific Jewish cookbook author and two by Gregg Malouf a chef and Turkish and Middle Eastern cookbook author,combining the fava with artichokes. I had some artichokes in the refrigerator so I proceeded to make my own version of fava with artichokes, for a wonderful braised vegetable side dish. Traditionally Sephardim eat a lot of braised and simmered vegetables, like green beans, okra, zucchinis, and artichokes. Many times, they combine them with meat. 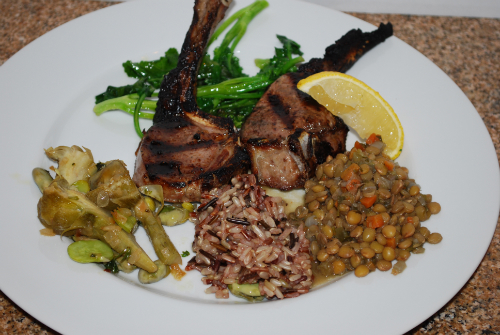 I tend to cook a little more California fresh style most of the time, serving crisp tender cooked vegetables. However, now in the interest of recording and sharing my Sephardic cooking heritage I am rediscovering some recipes while just writing down and quantifying others. This dish is for spring when artichokes and fava are just arriving and Sephardim serve it during Passover as well. If your tradition allows you to eat beans during Passover, give it a try. Scrape the zest off the lemon and set it aside to garnish the dish later. Cut the lemon into quarters and squeeze it into the bowl of ice water. To prepare the artichokes crack off all the tough outer leaves. Take a sharp knife, trim the bottom of the stem, and then peel it. 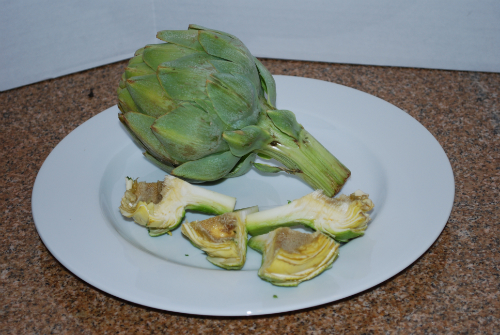 Cut the remaining center leaves of the artichoke straight across above the heart, leaving the heart with the choke. Using a sharp paring knife or a small melon baller remove the choke with the thistle fuzz exposing the heart. This creates a perfect little bowl for stuffing, but that is another recipe, for Passover. 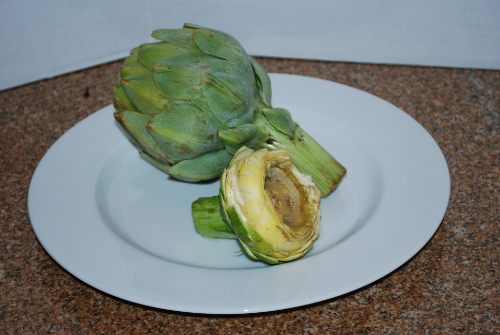 Plunge this pared artichoke into the lemon water to keep it from oxidizing. Repeat this procedure for the remaining artichokes. One by one remove the artichokes and cut them in half and then depending how big they are, cut each half in quarters. Each piece should have some heart and some stem. Keep the artichokes in the acidulated water until you are ready to use them. 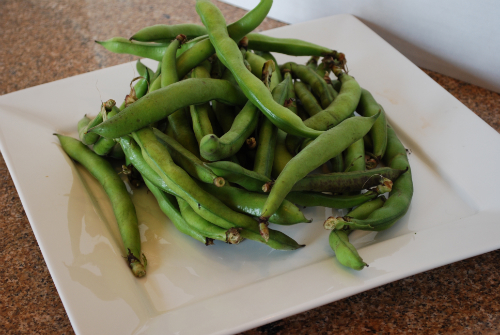 Blanch the beans for a moment, in a pot of boiling salted water, and then remove the tough outer skin. It should peel off easily. Heat a large sauté pan; add the olive oil and then the onions. Sauté the onions briefly until translucent and then add the garlic and the artichoke hearts. Sauté for about 5 minutes, season with salt and pepper and then add the blanched beans. Continue to sauté. When the mix starts to stick add the water, ½ cup at a time. The water allows everything to steam through until tender without sticking. When the water is almost all evaporated, add the lemon juice, parsley and honey. Taste and add more salt and pepper if desired. Stir for a bit longer until the artichokes are tender. Garnish with the lemon zest and serve. This dish is great served cold for lunch as well.